Matt Doherty speaks to the media. MATT DOHERTY DOESN’T want for confidence. That much was evident at a press conference at the Irish training centre in Abbotstown, when he was asked for the reasons behind his terrific season at Wolves. “I just think I’m good enough. “I didn’t start the season too well, but I’ve got myself a lot fitter. But I’ve been able to adapt, and confidence is everything. I’m super confident at the moment, every time I go out to play I feel great. It was expected that Doherty would be one of the biggest winners of Mick McCarthy’s replacing Martin O’Neill, given that the pair worked together at Wolves. “He is a very good man-manager, first. From my time at Wolves, he nurtured me and took care of me when I was in a couple of sticky situations. Him and TC [Terry Connor] do a lot of the coaching on the pitch, and even in the little bits of training so far he knows exactly what he wants us to do. We haven’t done huge shape sessions, but he’ll stop [sessions] with a couple of pointers here or there. “The next couple of days we’ll learn more of an idea of what he wants, but the main thing I’d say is he’s a great man-manager. “He wants to get involved with the banter between the lads, and he’s quite funny at times. None of that has changed, he hasn’t lost any of his sense of humour. He is always looking to be involved in some way. “And that’s good, you need a manager who is friends with you in a way, but onoe you respect him because he is your manager. Doherty only broke into the squad toward the end of O’Neill’s reign, when his Premier League form couldn’t be ignored. His lack of opportunity under O’Neill led him to venture that perhaps his “face didn’t fit”, although he was unwilling to delve further into the topic at Abbottstown this morning. “I don’t pick the team and it didn’t work out for me personally, for whatever reason. Hopefully that will be different [under McCarthy]. Doherty was naturally asked if camp under McCarthy has differed in this respect. “We’ve only been in a couple of days”, Doherty replied. Doherty’s form is such that it is difficult to exclude him, and McCarthy hinted this week that he may play Doherty as an orthodox right-winger, on the same flank as Seamus Coleman. Should it come to pass, Doherty is happy to adapt to what will be a slightly unfamiliar role, given he plays as a right wing-back for his club. “I haven’t played in a flat four on the right-hand side for a long time. But the position I play at Wolves, I am on the right-hand side on my own, quite often. “It’s something I am comfortable with. “The position I play at club level, I’m doing both. So I’d be comfortable doing both. “At the end of the day, I’m probably a full-back and that’s my main position, but I have no issues playing further up the field. “If that’s the way it is and I want to be successful, I can’t expect everywhere I go to be like Wolves. Although he and Seamus Coleman may be perceived as direct rivals, Doherty says the pair don’t compare form. “We’ve spoken a lot, but we don’t talk about form, but normal football things. The Irish squad fly to Gibraltar tomorrow, ahead of a training session at the stadium on Friday. They have no new injury concerns ahead of that flight, with Conor Hourihane and Aiden O’Brien linking up with the squad ahead of today’s training session. Hourihane was given time off following the birth of his child, while O’Brien is a replacement for the injured Shane Long. Email “Matt Doherty open to playing unfamiliar right-wing role for Ireland”. 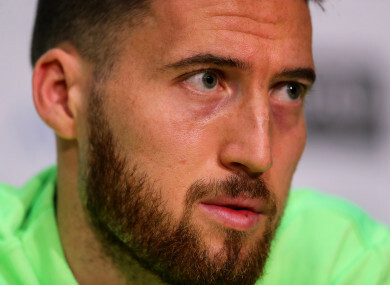 Feedback on “Matt Doherty open to playing unfamiliar right-wing role for Ireland”.